To the RA yesterday to see the Manet : Portraying Life exhibition. Exhibitions of Edouard Manet’s works are few and far between over here mainly because his true masterpieces are fastidiously retained by the Musee d’Orsay in Paris. The RA has not been successful in prising works such as The Luncheon On the Grass, the Bar at the Folies Bergeres and Olympia from the grasp of the French and so has had to content itself with exploring his portraits. Operating under this handicap, the RA has made a good fist of the exhibition although it is a bit like the proverbial curate’s egg in reverse. To get the gripes out of the way first – there are too many blank walls and the use of the third room (out of eight) to display a map of Paris at the time that the artist lived there just smacks of padding. An undoubted masterpiece, Music in the Tuileries gardens – a modernist take of a typical Zoffany ensemble a century on – is too small to carry off a room in its own right. To stretch out little over 60 exhibits across eight rooms has proven to be somewhat of a challenge. That said, there are some undoubted masterpieces on display. My particular favourites were The Railway, the arresting portrait of Emile Zola, the two contrasting portraits of fellow artist, Berthe Morisot – in the one of her in mourning her face seems to melt in grief – and the magnificent first room which contains some of the many portraits of his wife and son (or was he his half-brother? – Leon’s paternity is disputed). Some of the pictures are unfinished (some too unfinished to warrant prominence in an exhibition of this stature) but give an insight into his technique. Manet’s brush strokes are bold and, at times, frenetic giving the impression that he painted in one take. In reality, however, he took almost Virgilian care over his work, often scraping back to the canvas at night what he had painted during the day. Stylistically, Manet stands as the bridgehead between the classical styles and the Impressionists with whom he associated and was seen as a father figure to but was never really content to be numbered amongst. He was concerned to paint real life and his choice of subject matter and style often provoked violent reactions from his contemporaries. What is distinctive about Manet’s portraiture is his use of black in all its shades which has the impact of accentuating the lighter colours and tones on the canvas. He also makes use of what might be termed a dappled effect which brings further light and shade to his subjects. I was fascinated by his use of vertical and horizontal props – railings, balconies, trellises – which clearly helped him to design his picture and to draw his viewer’s eye to where he wanted. In many of the (finished) pictures, the background is often as interesting as the subject itself. The exhibition, despite its pre-opening hype, was not overcrowded when I got there – perhaps an unintended benefit of having too few exhibits in too large a space – and people queuing on spec for tickets seemed to move along with ease. It has to be recommended simply because of the rarity of seeing Manet’s works en masse over here but, I think, it could have been so much better. Until very recently most people would have struggled to locate the ancient Saharan kingdom of Mali on the map – how times have changed as the benighted country is now in the middle of a civil war and the recipient of Western military ”assistance”. For those of us who love African music, Mali along with Senegal is the hotbed of the distinctive African music which gave so much to the American blues and Bassekou Kouyate is the pre-eminent exponent of the ngoni. The ngoni is a string instrument, a bit like a lute, made of wood or calabash with dried animal skin, often goat, stretched over it like a drum. It makes for a distinctive sound and is thought to be the predecessor of the banjo. 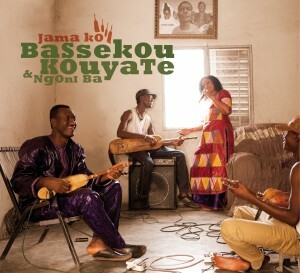 Jama Ko, Bassekou’s latest album, is a departure from his earlier albums which featured traditional Malian songs played on traditional acoustic ngonis. Here, Bassekou has wired up his ngoni and makes extensive use of the wah-wah pedal transforming his instrument’s sound to something which is like a high-pitched electric blues guitar. And the songs are intensely political by nature drawing on Mali’s tolerant past and name checking former kings who resisted attempts to impose Islamic culture on the populace. Apparently, the adoption of a heavily politicised style came about by accident. As Bassekou was starting recording the album in March 2012, the president, Amadou Toumani Toure, was overthrown and the civil infrastructure began to collapse. His response was to plug the ngoni into an amp and record Ne Me Fatigue Pas – Don’t wear me out. The band features his two sons – Madou and Moustafa – ngoni supremo, Abou Sissoko and his wife, Amy Sacko on vocals. Guests such as Khaira Aby on the wonderful Kele Magni and Kasse Mady Diabate and blues veteran, Taj Mahal, make for a truly all-star cast. Stand out tracks are Sinaly which uses stories from Mali’s past to attack those enforcing radical Islamic law, the previously mentioned Ne Me Fatigue Pas which is an angry reaction to the coup with frenetic percussion work on the talking drum and Wagadou which is an emotional plea for the return to traditional tolerance. The album ends quietly with Moustafa, a tribute to Bassekou, sung by his son. A truly wonderful album which, I hope, has its desired effect of bringing peace back to the region. If you are a fan of African music you will love it. If you haven’t experienced the power and beauty of the music that comes from this region, check this album out. As a small boy I loved Kenneth Grahame’s marvellous Wind in the Willows. I was particularly enchanted by the opening passage where Mole, after his winter hibernation, scrabbles up to the surface to enjoy the warm spring sunlight. I feel just like Mole having emerged blinking into the bright sunlight after my Kafkaesque nightmare of dealing with Vodafone. It all began innocently enough three weeks ago. 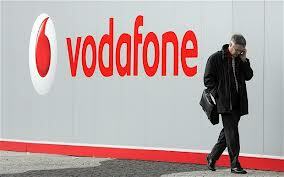 I have been a Vodafone customer since 1991, really ever since mobile phones were generally available. In those days they were the size of a house brick and had a battery life of around an hour or so – that is if you didn’t need to make a call or someone had had the audacity to call you. The phone came with a spare battery which I carried around in a backpack. Anyway, I have had my last handset for about 6 years – a steadfastly single function machine which just allows me to make and receive calls and send texts – and it is starting to show its age and malfunction. I thought it was about time I upgraded the handset and investigate the brave new world of smartphones. I looked out my latest Vodafone bill – just over £70, thank you very much for the privilege of using it for a month – and dialled the number on it for customer enquiries. The number was out of use and, helpfully, the recorded message had no forwarding number to call. The e-mail address on the invoice was also no longer in use – my e-mail just bounced back. Great! Going on to the Vodafone website I found a number to call and this is where my nightmare began. After, finally, getting through and quoting my mobile number and account number I was informed that my account couldn’t be found on the system. Despite my protestations that they had no trouble in extracting said £70 per month from my bank account which kind of suggested I was a customer of theirs and that I had a phone with constant access to their network, I was informed they couldn’t help me. A good 45 minutes wasted. The next day I tried again – same story – but at least someone at the other hand had the wit to listen to my story and recognise that I might be an old (in my vocabulary, loyal) customer and that my records might be on an old system. I was eventually transferred to the small business team to be informed that yes they could locate my account but that I was on a Pay as You Talk plan, an invoice had just been issued and was outstanding and so, until it was paid, they couldn’t help me. I left my next encounter with the byzantine Vodafone machine until I was pretty certain my monthly direct debit had been paid. My invoice clearly states that I am on an Anytime contract – I have never had to top up my account. Eventually I got through to the right department – same response – but I eventually got them to investigate my account further and it seems that a flag on the system had been incorrectly set to Pay as You Talk. This was rectified – progress of sorts. I was then able to upgrade my phone – to a Samsung Galaxy S3 – and to change my plan. The phone duly arrived – two days later than promised and minus a SIM card. Foolishly, I thought I could go into my local Vodafone shop – for the rudest and most unsatisfactory customer service experience I would recommend a visit to the Vodafone retail outlet in Camberley – get a SIM card, change my number over from my old handset and off I would go to experience the brave new world of smart phone telephony. Not a bit of it. “Can’t find your number on the system. Your account number is too short”. I retell my story. “Can’t help you – you are not a Vodafone retail customer”, although they did give me a SIM card. So I – not they – have to spend the next 90 minutes on the phone trying to get some resolution to my problem – no joy. Back on the phone yesterday – this time for 45 minutes – round the Wrekin, as we say in Shropshire, several times until I get put through to Carly who was able to see what the problem was and effected the activation of my SIM card and the change to a more cost-effective plan. So three weeks in I have now effected what I thought was a fairly simple request – an upgrade of a phone and a change of account. My experience beggars belief. It seems that Vodafone is set up purely to deal with customer churn – people joining and leaving their benighted network with regularity – rather than customers who are happy to stay where they are. To cap it all I now keep being bombarded with text messages asking me to rate my Vodafone experience – even Schiller might have been hard-pressed to come up with an appropriate aphorism. (This post was not sent from a Samsung Galaxy S3 handset). Britain is just coming out of its mini cold snap – you know the score, media-fuelled frenzy and panic, emergency adverse weather train timetables etc etc – and so it seems timely to induct our sixth member into the Clever Bastards hall of fame. Step forward, Thomas Midgley. For those of you who are unfamiliar with the genius of the American chemist, Midgley almost single-handedly contributed to the acceleration of global warming with his discoveries and also died in a vaguely amusing way. Midgley first applied his mind to the problem of engine knock – this is where petrol “detonates” from pressure and not spark ignition. This usually happen when there is too much oxygen in the air/fuel mixture or where the ignition timing is too far advanced. He solved the problem by identifying the petroleum additive, tethraethyl lead, or leaded petrol, what was later to become the bane of the environmentalists. There was, besides accelerating global warming (sorry, Boris, but there is such a thing) a problem with using tethraethyl lead and that was that it corroded the valves and spark plugs of engines. The ever resourceful Midgley solved that problem – but not the environmental havoc his discovery was wreaking – by employing bromine and inventing a method to extract large quantities of the stuff from seawater. In 1930 Midgley was asked to find an inexpensive non-toxic refrigerant for use in household appliances by General Motors. He discovered that dichlorodifluoromethane, or Freon for short, fitted the bill. Freon is a major member of the CFC (chlorofluorocarbon) group of organic compounds which, too, have made a major contribution to the depletion of the ozone layer. Leaded petrol and CFCs – well done, Tom! Naturally, all this fooling around with lead had a deleterious effect on Midgley’s health. He eventually contracted polio in 1940 and lead poisoning which left him disabled and bed-ridden . Despite his disability, he remained active amongst the chemistry community and even served as president of the American Chemical Society (ACS) in 1944. Midgley contributed to his own demise by applying his brilliant but dangerous mind to his own predicament. He wouldn’t let being bed-ridden defeat him so rigged up an elaborate system of pulleys and ropes to lift him out of bed. Unfortunately, at the age of 55 and just one month after reciting his prescient verses, he managed to asphyxiate himself after being strangled by one of the pulleys. So, all three of his inventions contributed to his death – truly, a worthy member of our illustrious pantheon! Another home game against one of the relegation candidates and another two points spurned. Gayle, Mambo and Purdie came in for Goldson, Grandison and Summerfield. The game produced little in the way of chances – a free kick from Skarz in the first half required a smart save from Weale, McAllister struck the bar for TMS and Bury had an effort cleared of the line was pretty much the sum of 90 minutes’ effort. TMS badly lacked some strength and guile up front and with Gayle and Jacobson off their game the midfield were drawn in too deep creating a massive gap between the defensive and offensive units of the team. A frustrating afternoon but at least TMS didn’t lose and preserved the 8 point gap between them and Bury. With increasing frequency I see something in the papers which causes a violent reaction – indeed, that was the motivation behind setting up this blog. Fortunately, I read my newspapers in electronic format so I am spared the embarrassment after a particular violent splenetic reaction of having to gather up the pages and reassemble the journal. Figures recently released suggest that the over 55s are the biggest users of e-readers – partly, in my view, because of the tendency to see stuff that causes outrage and partly because of the useful function that allows us to alter the text size. No more large-print editions or, heaven preserve us, audio books for us! Anyway I digress. The latest thing to get my goat was a story that the Beeb has had the audacity to drop a scene from an episode of Fawlty Towers because of its inherent racism. The episode of this iconic 1970s sit com is the German one where Basil, the ill-starred hotel proprietor, has some German guests and he is on tenterhooks not to mention the war. Many people might think that the whole premise of the episode is racist or at least potentially offensive to our Teutonic neighbours. But no. The scene that has fallen foul of the censor’s latest bout of PC madness is the one where the Major, a Colonel Blimp type character, relates his visit to the Oval with a woman to watch a test between England and India. The Major reports that he had to correct his companion’s use of the n-word to describe the opposition and pointing out that the w-word is the more apposite description for Johnnies from the sub-continent. Certainly, in the context of the period pretty harmless stuff and if anything it satirises the Major as being a man out of touch with the times. One of the benefits of being old is you can get away with statements that coming from younger people would provoke outrage. “Oh, it is only Aunty Mabel, she’s not all there, you know” we remark to each other as we leave a statement that would have caused the cheeks of even the most rabid EDL supporter to rouge. For heaven’s sake, programmes made thirty odd years ago reflect the mores and attitudes of the time in which they were made. We cannot go round re-editing them to conform with current-day sensibilities or they lose all their artistic credibility. Surely it is time to accept the audience has the wit to discern what is funny or acceptable rather than nannying them all the time. The Beeb has got bigger issues to concern itself with than imposing ridiculous PC standards. Perhaps the answer for those recidivists who want to test their motoring skills after a drink down the pub is to move to rural Kerry in south west Ireland. Astonishingly, the councillors have this week voted by five votes to three (sixteen councillors did not turn up, presumably their wits being too befuddled by an afternoon on the black stuff to find their way to the council chambers) to allow rural residents to receive permits, issued at the discretion of the local Garda, allowing them to consume more than the legal limit and then drive home. The proponent of the motion, Danny Healey-Rae, painted a mournful picture of individuals trapped at home, staring at four walls with only a bottle of whisky for solace. Far better to allow them to jump on their tractors, drive to their local hostelry, consume a few sharpeners and then drive home. Three of the five councillors voting in favour, including Healey-Rae, are publicans, although I am sure that this did not sway their decision. It is not clear how the new permissible limit would be arrived at. Perhaps drivers seeking to exercise their rights under the permits will have to follow two individuals on foot carrying a flag so at least they can aim at the middle one and on-coming motorists can be alerted to the imminent hazard..
Needless to say, the decision has provoked the ire of the ‘Elf and Safety brigade and it is thought highly unlikely that the Irish justice minister will sanction a liberalisation of the country’s drink drive laws. Still, you’ve got to admire their chutzpah in promoting an innovative scheme to counter depression amongst the rural communities and can’t help but reflect on what a wonderful thing democracy is.